A target of 53,000 tree seedlings have been earmarked for planting in the second phase of the Mt. Kenya Forest restoration sponsored by Kenya Breweries Limited (KBL). This phase will involve five community forest associations (CFAs): Hombe, Kabaru, Naro Moru, Gathiuru and Ngare-Ndare. 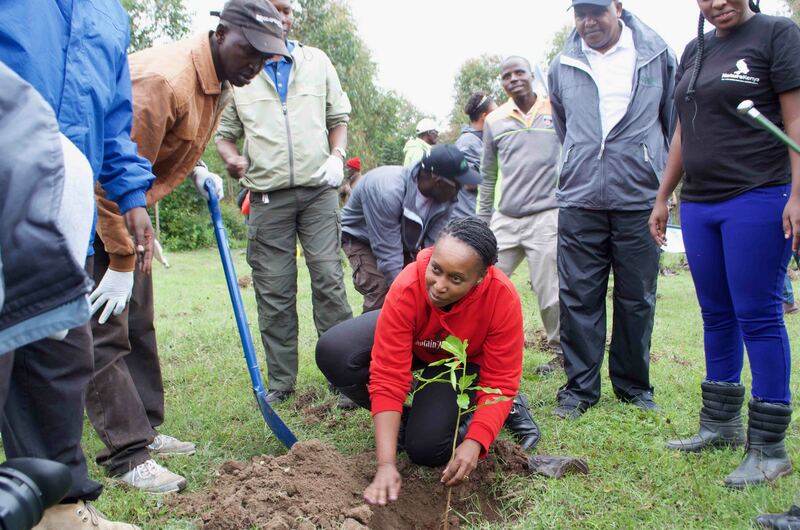 The tree-planting exercise was flagged off by KBL’s Finance Director Ms. Kinya Kimotho during the World Environment Day celebrations held on June 5 at Naro Moru, Nyeri County. A team from KBL, under the staff-driven Kijani Team initiative, joined members of the community in planting 2,500 tree seedlings at Naro Moru. Speaking during the event, Ms. Kimotho, who is also the Kijani Team patron, expressed KBL’s commitment to environmental conservation, particularly the restoration of Mt. Kenya Forest. Ms. Kinya added that KBL was proud to have come this far with the forest restoration programme. Launched in 2017 by KBL in partnership with Nature Kenya and local CFAs, the Mt. Kenya Forest restoration initiative aims at restoring 250 acres of degraded forest in Mt. Kenya by planting 100,000 tree seedlings by the end of 2018. A total of 47,000 tree seedlings were planted in different blocks of Mt. Kenya Forest in 2017. The initiative not only contributes to reforestation, but also supports over 30,000 beneficiaries around the Mt. Kenya Forest. All seedlings planted are sourced from the five CFAs. The CFAs are also involved in the planting and nurturing of the trees. The public-private sector partnership for sustainable water flows from Mt. Kenya forest is a Nature Kenya initiative that seeks strategic commitment and support from the business sector to enhance the quantity and quality of water flowing from Mt. Kenya.